This beautiful pin has a symbol of the Holy Spirit placed on a field of blue, speckled and trimmed with gold. The Lamp of Wisdom and Knowledge has a dark blue base with a red and gold flame. 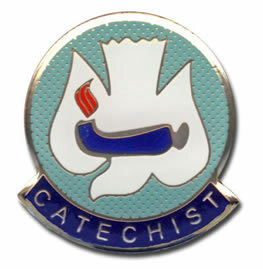 The word "Catechist" is boldly printed in gold.